Tag line: "Wanted: For chicanery, skulduggery, tomfoolery and habitual bungling!" Disney churned out a fair number of live-action family films in the ‘60s and ‘70s, some good (The North Avenue Irregulars) and some bad (Superdad). Set in the rough and tumble days of the Wild West, 1975’s The Apple Dumpling Gang was one of the studio’s absolute best. On his way to New Orleans, gambler Russell Donovan (Bill Bixby) stops over in Quake City, California (so named because the entire town was built on a fault line, making it susceptible to earthquakes). While playing cards in the local saloon, Donovan is approached by John Wintle (Don Knight), a former acquaintance who's heading out of town. In need of a favor, Wintle pays the gambler $5 to look after a package that’s arriving by stagecoach the following day. To Donovan’s horror, Wintle’s “package” turns out to be a trio of orphan kids: Bobby (Clay O'Brien), Clovis (Brad Savage), and Celia (Stacy Manning). Realizing the shady Wintle duped him, Donovan goes door-to-door trying to unload the three urchins on any family willing to take them. As he's doing so, the kids head off to a gold mine that belonged to their deceased father, where, after a sudden tremor, they find an enormous nugget of gold, valued at almost a hundred thousand dollars! As a result of their new-found wealth, many of the families that initially refused to take the tykes in are now anxious to adopt them, causing Sheriff McCoy (Harry Morgan), who doubles as the town’s Judge, to recommend to Donovan that he get married, which would allow him to retain custody of the children. Wanting only what’s best for the little scamps, Donovan proposes to Magnolia Clydesdale, aka “Dusty” (Susan Clark), the stagecoach driver who already has a great rapport with the kids. Meanwhile, two bumbling crooks named Theodore (Don Knotts) and Amos (Tim Conway) are trying (and repeatedly failing) to steal the children’s gold, and as the good citizens of Quake City will soon discover, they aren’t the only bandits in town. Just about everything clicks in this movie, from its realistic western setting to its catchy theme song (performed by Randy Sparks and The Back Porch Majority). The cast is also excellent. Bill Bixby delivers a solid performance as the card shark who unwittingly becomes the guardian of three kids, and Susan Clark is very believable as the tomboy that enters into a “business arrangement” with Donovan, agreeing to marry him only because it will allow her to look after the children. Of course, the real stars of The Apple Dumpling Gang are Don Knotts and Tim Conway, playing a pair of thieves who can’t seem to do anything right. One scene in particular, where Theodore and Amos sneak into a firehouse to swipe a ladder, moving quietly so as not to wake the fireman (Owen Bush) sleeping nearby, is a masterwork of physical comedy. Some aspects of the film haven’t aged well, notably its use of rear-projection to simulate movement (a process that, even back in the day, was rarely convincing). 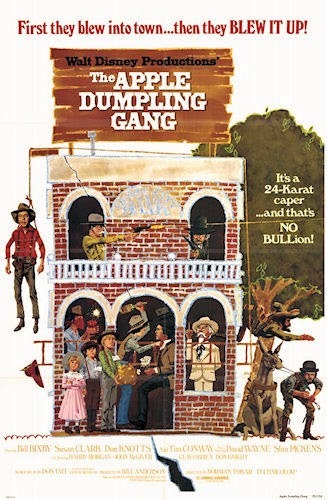 Yet despite its shortcomings The Apple Dumpling Gang remains an entertaining motion picture, and one of the finest live-action movies Disney ever produced.